Why is brushing with it important? 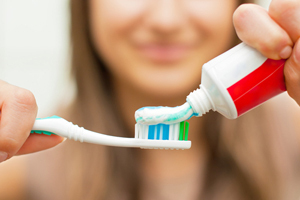 Brushing with toothpaste is important for several reasons. First and foremost, a toothpaste and a correct brushing action work to remove plaque, a sticky, harmful film of bacteria that grows on your teeth that causes caries, gum disease, and eventual tooth loss if not controlled. Second, the toothpaste contains fluoride, which makes the entire tooth structure more resistant to decay and promotes remineralization, which aids in repairing early decay before the damage can even be seen. Third, special ingredients help to clean and polish the teeth and remove stains over time. Fourth, toothpastes help freshen breath and leave your mouth with a clean feeling. As long as your toothpaste contains fluoride, the brand you buy really does not matter, whether or not it is in paste, gel, or even powder form, or containing a certain flavor. All fluoride toothpastes work effectively to fight plaque and cavities and clean and polish tooth enamel. Your toothpaste brand should also bear the ADA (American Dental Association) seal of approval on the container, which means that adequate evidence of safety and efficacy have been demonstrated in controlled, clinical trials. If your teeth are hypersensitive to hot or cold, consider trying a toothpaste designed for sensitive teeth. Toothpastes containing baking soda and/or hydrogen peroxide (which are both good cleansing agents) give the teeth and mouth a clean, fresh, pleasant feeling that can offer an incentive to brush more, but fluoride is the true active ingredient at work protecting your teeth. Some prefer a tartar control toothpaste containing pyrophosphates to prevent the buildup of soft calculus deposits on their teeth. New pastes offer advanced whitening formulas aimed at safely removing stains to make teeth brighter and shinier, although they can’t nearly match the effectiveness of a professional bleaching formula administered or prescribed by a dentist. Children under 6, however, should only be given a very small, baby pea-sized dab of toothpaste on their brush.